Arginine biosynthesis in Escherichia coli is elevated in response to nutrient limitation, stress or arginine restriction. Though control of the pathway in response to arginine limitation is largely modulated by the ArgR repressor, other factors may be involved in increased stationary phase and stress expression. In this study, we report that expression of the argCBH operon is induced in stationary phase cultures and is reduced in strains possessing a mutation in rpoS, which encodes an alternative sigma factor. Using strains carrying defined argR, and rpoS mutations, we evaluated the relative contributions of these two regulators to the expression of argH using operon-lacZ fusions. While ArgR was the main factor responsible for modulating expression of argCBH, RpoS was also required for full expression of this biosynthetic operon at low arginine concentrations (below 60 μM L-arginine), a level at which growth of an arginine auxotroph was limited by arginine. When the argCBH operon was fully de-repressed (arginine limited), levels of expression were only one third of those observed in ΔargR mutants, indicating that the argCBH operon is partially repressed by ArgR even in the absence of arginine. In addition, argCBH expression was 30-fold higher in ΔargR mutants relative to levels found in wild type, fully-repressed strains, and this expression was independent of RpoS. The results of this study indicate that both derepression and positive control by RpoS are required for full control of arginine biosynthesis in stationary phase cultures of E. coli. The biosynthesis and/or scavenging of arginine are important during host colonization by uropathogenic Escherichia coli. In urine, expression of the E. coli argCBH operon and artJ, encoding a periplasmic transporter, increases more than 10 fold  and 18 fold , respectively. Synthesis of arginine is likely required during infection as the concentration of arginine found in urine is below that necessary to support maximal growth of E. coli . Consistent with these data, infection challenge in a murine model with E. coli strains carrying mutations in the argC gene results in impaired proliferation in the kidney . In enteropathogenic E. coli  arginine synthesis and transport, together with arginine decarboxylase (encoded by adiA), are important components of the cell's acid resistance repertoire [3–5]. Under nutrient-limiting conditions, E. coli can potentially utilize arginine as both a carbon and a nitrogen source . Arginine is a precursor for the synthesis of polyamines, putrescine and spermidine, which may reduce oxidative damage to proteins and DNA [7, 9]. In addition, in phosphate-starved cells, aerobic metabolism of arginine may be an important physiological adaptation that is intimately associated with cell survival . Since arginine contains 11% of the cell's nitrogen in stationary phase , biosynthesis of this amino acid is likely important under sub-optimal conditions. Arginine is synthesized by a complex biosynthetic pathway consisting of several operons and unlinked genes that are controlled by ArgR  which represses by binding to a conserved ARG box [13, 14] to overlap with RNA polymerase binding sites. Maximum derepression occurs in the absence of arginine . In contrast to most amino acid biosynthetic genes, the expression of the arg biosynthetic genes increases briefly during diauxic growth arrest . As this stress is similar to that imposed by nutrient limitation, it is plausible that stationary phase regulators participate in control of arginine biosynthesis. Several enzymes required for arginine catabolism are controlled by RpoS, an alternative stationary phase sigma factor , including those encoded by astD [11, 17], and cstC (astC) [11, 18]. Many of the members of the large RpoS regulon are specifically expressed during the transition to stationary phase growth [19, 20]. Although clearly required for virulence in Salmonella , the role of RpoS in the pathogenesis of E. coli is equivocal. RpoS controls many functions that contribute to host adaptation, including osmotic stress  and acid challenge . In E. coli, however, RpoS mutants are not impaired in colonization of the urinary tract  or gastrointestinal tract  in animal models. There are several different alleles of RpoS found in natural populations of E. coli , and it is thus possible that RpoS regulation may be strain specific. In a previous study, we identified many independent RpoS-dependent operon fusions . Two of these mapped to the argCBH operon and were of particular interest because, unlike other RpoS-regulated functions that we identified, this operon, when mutated, rendered the cell auxotrophic. In this study, we have employed these fusions as probes to examine regulatory controls on transcription of the argCBH operon to identify how this key biosynthetic pathway is activated. In a large mutational screen, we isolated over 100 RpoS dependent operon-lacZ fusions [26, 27], many of which were not known to require RpoS for expression. Two of the isolated fusion mutations mapped to the argCBH operon (Fig. 1) and were clearly RpoS-dependent on indicator plates (Fig. 2). While both fusions were in argH; one was intragenic and, as expected, rendered the cell auxotrophic for arginine (rsd 1072) and the other fusion (rsd 1066) was located between the argH coding sequence and a predicted transcriptional terminator (Fig. 1). Strains carrying the rsd 1066 fusion do not have an arginine auxotrophic phenotype (data not shown). Location of operon fusions in strains used in this study. Arrows indicate the direction of transcription of genes. Expression of argCBH-lacZ in WT, ΔrpoS, ΔargR and ΔrpoS ΔargR strains on LB plates containing X-Gal. Since ArgR is a known regulator of argCBH , we constructed combinatorial argR and rpoS mutants to determine the relative contributions of each regulator to the expression of the operon. Introduction of a deletion of argR into a strain with an argCBH-lacZ fusion resulted in high expression with or without RpoS (Fig. 2). 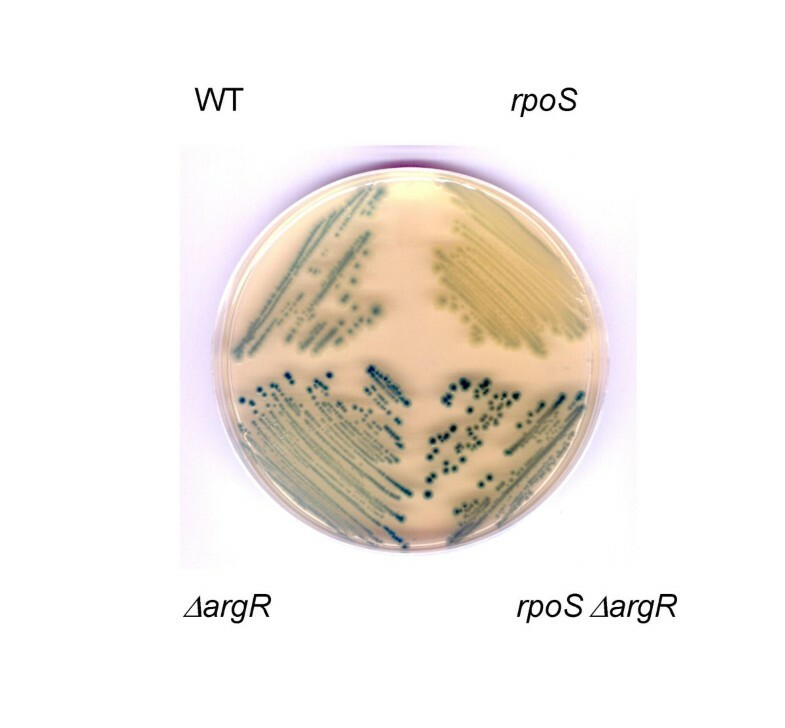 It is likely that RpoS-dependent expression of argCBH in the ΔargR strains may be masked by strong derepression as a consequence of loss of ArgR. To test if the expression of the argCBH operon is induced upon entry into stationary phase, expression of the operon was assayed in rich media. During entry into stationary phase, expression of argCBH increased 7-fold in wild type cultures, but only exhibited 3-fold increase in the ΔrpoS mutant (Table 1). This indicates that argCBH expression is not only growth phase-dependent but also is affected by loss of RpoS. Expression of argCBH expression was 14-fold higher in ΔargR mutants than in wild type strains and in these mutants, was independent of RpoS (Table 1). Expression of the argCBH operon in rich media. 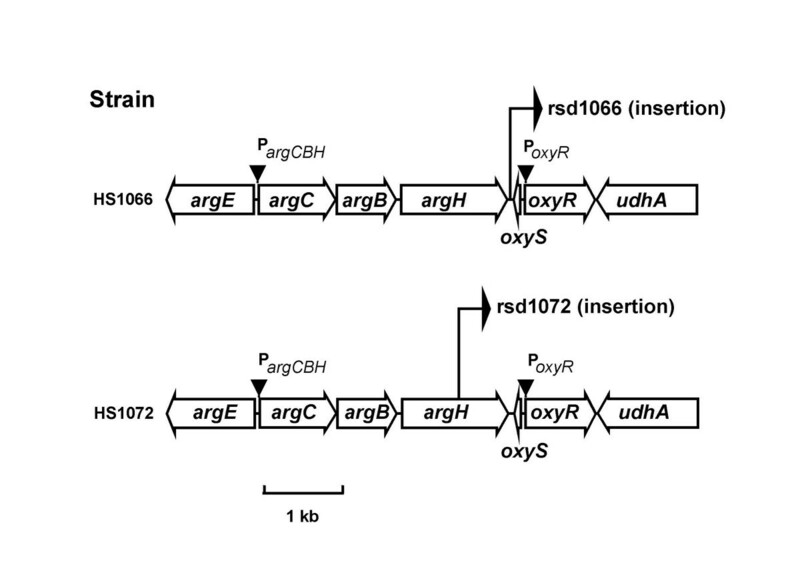 Wildtype, ΔrpoS and ΔargR strains harboring the rsd1066 operon lacZ-fusion to the argCBH operon were grown in LB media and assayed for β-galactosidase activity in exponential phase (OD600 = 0.3) and stationary phase (OD600 = 1.5) as described in Methods. All reported activities are the average of three independent determinations. RpoS is likely an important factor in amino acid scavenging in stationary phase . Amino acid biosynthesis offers an alternative to the scavenging strategy. It is possible that the RpoS effect on argCBH expression is more pronounced when arginine becomes limiting, as might be the case in stationary phase. To test this, expression of the operon was assessed in exponential phase cultures grown in minimal media supplemented with various concentrations of L-arginine. In strain HS1066 and its rpoS mutant derivative, HS1066p, argCBH expression was found to be inversely proportional to arginine concentration at arginine concentrations less than 60 μM (Fig. 3). Arginine biosynthetic genes, including argCBH, are normally induced in response to arginine limitation . However, in exponential phase cultures, argCBH expression was RpoS dependent only at arginine concentrations below 30 μM (Fig. 3). In stationary phase, argCBH expression was 2-fold RpoS-dependent at all arginine concentrations tested (data not shown). Surprisingly, ΔargR mutants were impaired in growth on minimal media even when supplemented with arginine, strongly suggesting that these strains possessed an additional unidentified nutritional requirement. Intermediates in the arginine biosynthetic pathway are also precursors in other pathways. For example, carbamoylphosphate, the product of carbamoylphosphate synthetase (encoded by the bi-cistronic operon carAB) is not only a precursor of arginine but is also required for pyrimidine biosynthesis . 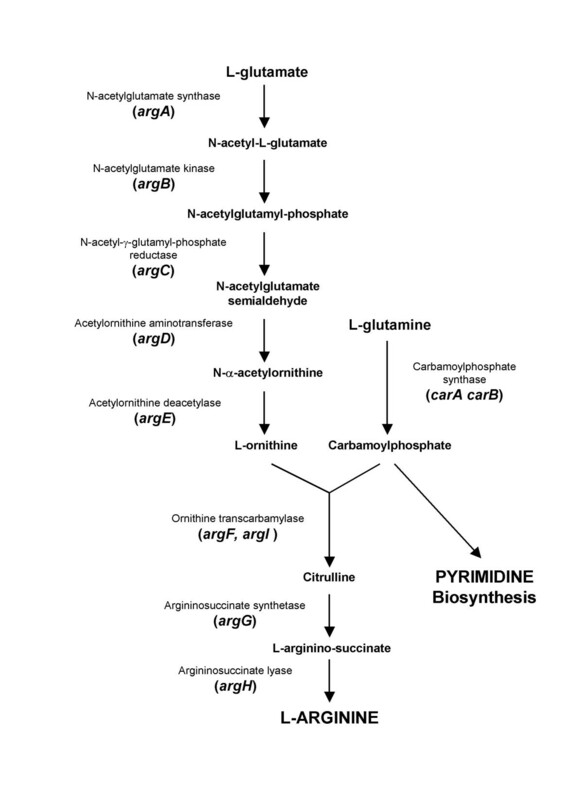 Therefore, it is possible that the derepression of arginine biosynthesis may deplete carbamoylphosphate required for synthesis of pyrimidine thus rendering ΔargR mutants auxotrophic for pyrimidine. To test this, we examined the growth of ΔargR mutants on minimal media supplemented with pyrimidines relative to argR+ strains. As shown in Table 2, the growth deficiency of ΔargR mutants could be completely suppressed by the addition of pyrimidines (growth of ΔargR and wild type strains were equivalent in the presence of added pyrimidines). We also compared the generation time of argR+ and ΔargR strains on minimal media with or without pyrimidines, and examined the average colony size by plating the cells on minimal media plates. As shown in Table 3, the generation time of ΔargR was much greater than that of the argR+ strain, and this growth impairment could be remedied by addition of pyrimidines into the media. The growth requirement was not absolute as some residual growth was observed in the ΔargR strain. Reduced growth could be due to either a uniform slow growth among cells or by the selection of suppressor mutants which could overcome impairment by acquiring advantageous mutations. The diameters of ΔargR deletion colonies were only one half that of argR+ colonies indicating ArgR is required for robust growth in minimal media. Furthermore, the colony morphology and size of all colonies were uniform, consistent with the idea that growth results were a consequence of poor growth of argR deletion mutants in general and were not due to suppression by selected mutants. To ensure that this was not a strain-specific phenotype, the ΔargR mutation was transduced and tested in another common laboratory strain, MG1655 and, as expected, the resultant transductants were similarly found to be pyrimidine limited (data not shown). To exclude the possibility that an uncharacterized mutation linked to the original operon fusion mutation was responsible for the pyrimidine phenotype, we tested an independently constructed argR deletion mutant from the Nara KO collection . This strain was similarly impaired in pyrimidine synthesis (data not shown). Effect of ΔargR on culture growth in minimal media. Overnight cultures in LB were washed in minimal salts 3 times and subcultured at 1:1000 dilution into minimal media and grown at 37°C, 200 rpm, and samples were plated on minimal media to determine the average colony size. We further examined the pyrimidine requirement by transforming an argR deletion mutant with an argR-containing plasmid clone from the ASKA collection . Colony size of the ArgR-complemented argR deletion mutant was more than twice that of the control strain after two days growth on minimal media (0.76 ± 0.03 mm vs. 0.34 ± 0.03 mm). The astCADBE operon, encoding a set of enzymes responsible in the arginine succinyltransferase (AST) pathway, is RpoS-dependent and can be induced in nitrogen limited environment especially when arginine is present . It is possible that RpoS affects argCBH expression through AST-mediated depletion of intracellular arginine resulting in increased derepression by ArgR. To test this possibility, an astCADBE deletion mutant was constructed in strains containing the argCBH-lacZ fusion, and the resultant mutant was assayed in rich media. In exponential phase there is not much expression difference in all these strains. However, in stationary phase, the expression of argCBH in Δast mutation strain was nearly 2-fold (an increase of 18 units) higher than that in ΔrpoS Δast double mutation strains (Fig. 4). 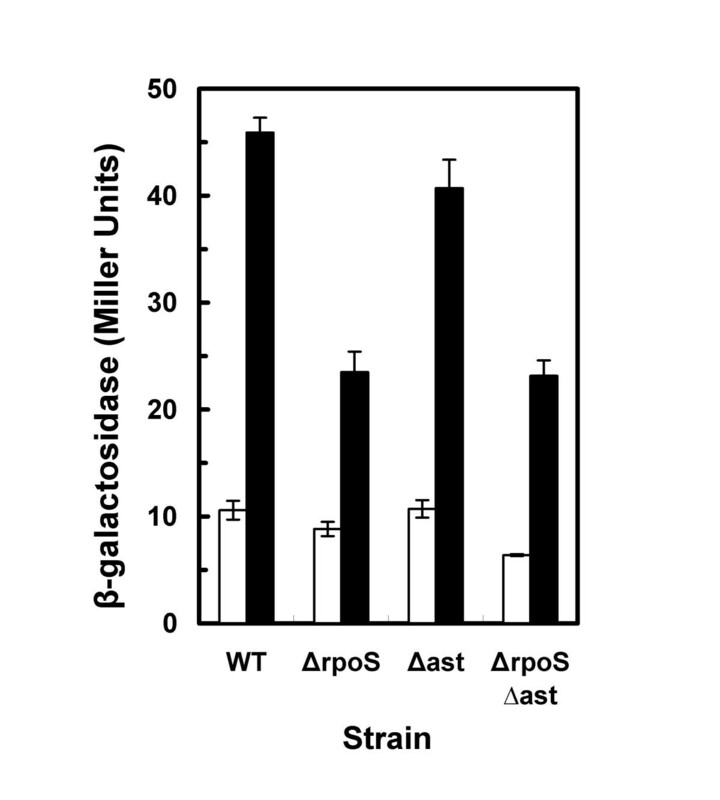 Thus, the RpoS-dependence of argCBH in Δast deletion background is consistent with results obtained using AST+ strains, and it is unlikely that RpoS-modulated argCBH expression is indirectly induced by arginine catabolism through the AST pathway. However, the expression of argCBH in Δast mutant was slightly lower (10% difference) than in the AST+ strain, indicating that metabolism of arginine through the AST pathway may have a slight overall effect on argCBH expression, probably through modulation of ArgR. Effect of astCADBE depleted arginine on argCBH expression in wild type, ΔrpoS, Δast ,and ΔrpoS Δast strains. Strains were grown in triplicate in LB rich media. Samples were taken in exponential phase (□, OD600 = 0.3) and stationary phase (■, OD600 = 1.5), and β-glactosidase activity was assayed as described in Methods. Since strains carrying a mutation in argH are auxotrophic for arginine (HS1072 this study), these strains could be used to establish the concentration at which this key amino acid becomes growth limiting. Similarly, because the operon fusion in strain HS1066 does not render the cell arginine auxotrophic but is nonetheless ArgR dependent, this strain can be used in parallel to assess ArgR-dependent activation of the operon during arginine restriction. 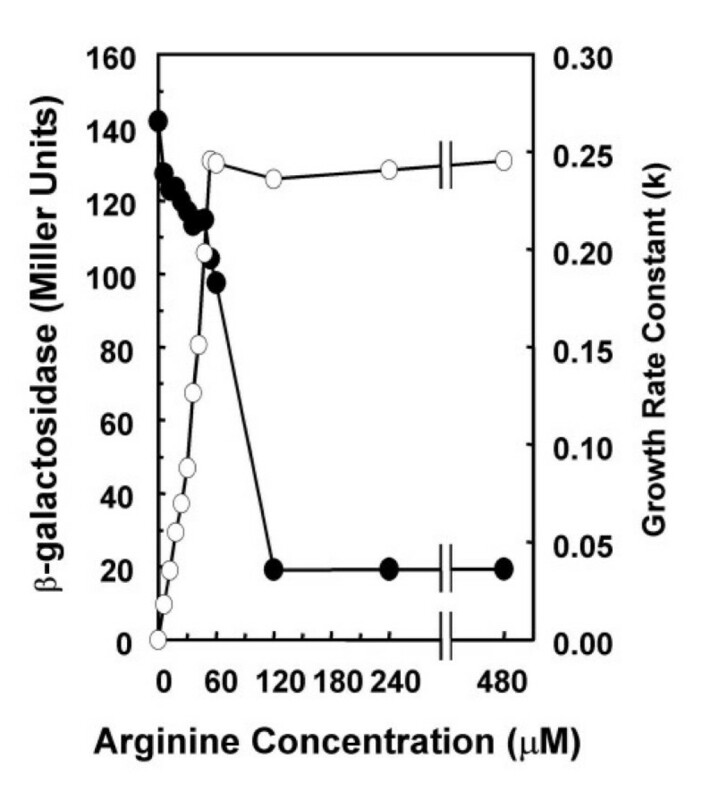 Growth of E. coli was impaired at arginine concentrations less than 60 μM: below this level growth rate was proportional to concentration of the limiting amino acid. Growth yield was similarly affected (data not shown). Derepression of argCBH expression was found to occur at concentrations below 60 μM and, as expected, was inversely related to arginine concentration (Fig. 5). Limitation by the availability of intracellular arginine may account for the reduced growth observed and, through ArgR derepression, may also be partially responsible for the increased expression of argH. Together, these data indicate that argCBH regulation is tightly coupled to arginine availability. At 60 μM, even though the cultures were not arginine-limited with respect to growth, the levels of argCBH were five fold higher than in fully repressed cells. This suggests that, in nutrient-starved cells, argCBH derepression would occur prior to potential growth restriction by arginine limitation ensuring maximum growth yield. Effect of exogenous arginine on growth and argCBH expression. Growth rate and argCBH expression were determined using an arginine auxotrophic strain, HS1072 and an arginine prototrophic strain HS1066, respectively, at the indicated arginine concentrations. Overnight cultures were grown with appropriate antibiotics, sub-cultured into minimal media and maintained in exponential phase for at least 8 generations prior to the start of the experiment. 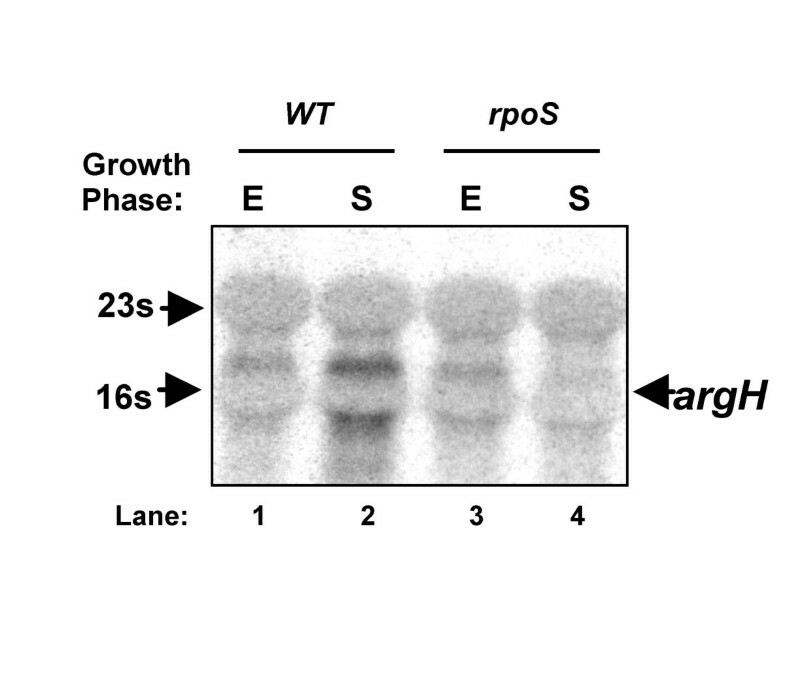 Although plate expression assays indicate that argH expression is clearly RpoS-dependent (Fig. 2), the results of reporter gene expression studies showed that RpoS dependence was only 2-fold, somewhat less than that found for most RpoS regulated genes . To resolve this discrepancy, we independently assessed expression of argH in wild type and rpoS mutant cultures by Northern analysis (Fig. 6). Consistent with reporter gene studies on plates, expression of argH was much higher in stationary phase cultures of the wild type strain than in the isogenic rpoS mutant and was much lower in exponential phase samples of both cultures. The hybridizing argH transcript co-migrated with the 16S RNA leading to some interference (Fig. 6). These results, in conjunction with the reporter fusion studies, indicate that expression of argH is both RpoS and stationary phase dependent in a wild type strain and is thus similar to many other RpoS-dependent genes . RpoS dependent expression of argH in exponential and stationary phase determined by Northern analysis. RNA was extracted from cultures grown in LB to OD600 = 0.3 for exponential phase (E) and OD600 = 1.5 for stationary phase (S) using the hot phenol method (as described in Methods). 5 μg of RNA was loaded in each lane. Signal intensity was quantified by densitometry and normalized to an arbitrary value of 10 for expression of the operon in stationary phase in the wild type strain. To determine if RpoS and ArgR modulation of argH expression results in changes in the level of the encoded enzyme, we assayed exponential phase cultures of strains deficient in the expression of these regulators for argininosuccinate lyase activity. This was tested by growing cultures in minimal media at suboptimal levels since the RpoS effect was most pronounced when cells were slightly starved for arginine (Fig. 3). The specific ArgH activity in WT was about 4 fold higher than that in rpoS- strain, while it was about 25 fold higher in argR- strain compared with the WT (Table 4). These results, together the lacZ expression and Northern data, supports the idea modulation of argH expression by RpoS is reflected at the level of protein synthesis. Specific argininosuccinate lyase (ASL) activity in exponential culture of WT, rpoS-, and ΔargR strains. Cultures were grown in M9 minimal media supplemented with 30 μM L-arginine and harvested at OD600 nm = 0.3. Cell extracts were assayed as described in the Methods section. ASL enzyme assay values were corrected for the low background levels of non-specific activity in the argH- mutant. In this study, we examined RpoS-dependent control of argCBH expression, and its modulation by ArgR and external arginine in Escherichia coli. Using independently-isolated mutants carrying operon fusions in different positions within the argCBH region, we conducted expression studies of this biosynthetic operon by assaying reporter gene fusions and by examining argH transcript levels in both a wild type strain and an rpoS mutant by Northern analysis. Since ArgR also regulates this operon , we evaluated the relative contributions of both ArgR and RpoS to its expression by constructing appropriate double and single null mutants. RpoS regulates many genes that play important roles in stress resistance and energy metabolism , but a subset of these RpoS-dependent genes including gabP , proP , proU , gadAB  and ldcC  aid in amino acid transport and utilization. In a previous genetic screen for RpoS-dependent genes , we identified one mutant that was auxotrophic for arginine and carried a mutation that mapped to the terminal gene member of the argCBH operon. To the best of our knowledge, this is the only RpoS-modulated gene known which, when mutated, renders the cell auxotrophic. As such, examining the regulation of this operon may offer unique insight into RpoS-controlled stationary phase physiology. Our data showing that stationary phase expression of the argCBH operon is affected by RpoS does not reveal whether this effect is direct or indirect. In fact for many members of the RpoS regulon such information has not been established. Indirect regulation is known to be operant for at least some members, including gadA and gadB, two glutamate decarboxylases that are among the most highly RpoS-dependent genes based on microarray analysis . The expression of these genes depends on GadX, a regulator whose growth phase dependent increase expression requires RpoS . RpoS can regulate its operon members directly (e.g. osmY ) or indirectly (e.g. gadW by the RpoS-dependent GadX regulator ). As RpoS dependence of argCBH was not observed in ΔargR mutants, ArgR appears to be necessary for RpoS-modulated expression of the operon. There are at least two mechanisms that could explain the increase in expression in stationary phase. In the first, as RpoS activates expression of its large regulon, depletion of intracellular arginine may result as a consequence of de novo synthesis of stationary phase proteins. 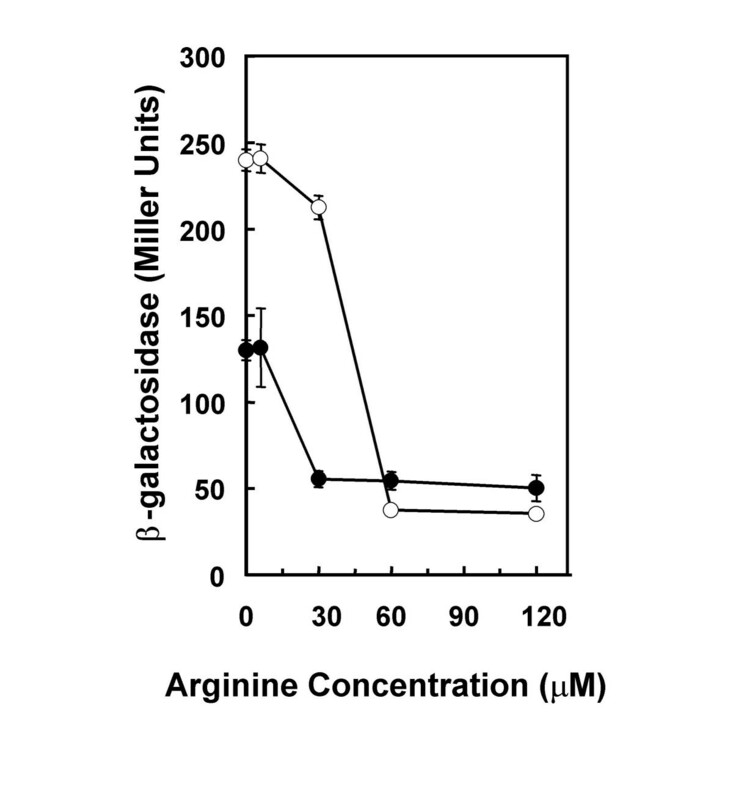 This may derepress the arginine biosynthetic pathway, resulting in an increase in argCBH expression. Alternatively, increased catabolism through the RpoS-dependent AST pathway lower intracellular arginine and might also result in de-repression of the operon. The latter explanation, however, seems unlikely in view of the fact that RpoS modulation of argCBH is not affected by deletion of the AST operon (this study). Using the arginine auxotroph (HS1072), we found that E. coli becomes growth limited at arginine concentrations below 60 μM. As derepression also occurs at these concentrations (this study), it appears that expression of the biosynthetic pathway is closely coupled to the biosynthetic need for arginine. As the concentration of arginine in LB media is about 60 μM , it is possible that our results could be partially explained by depletion of arginine during growth in late exponential phase. However, as supplementation with exogenous arginine did not markedly reduce stationary phase induction of the argCBH operon, it is likely that other mechanisms, including control by RpoS, ensure that this operon continues to be expressed under nutrient limited conditions. Surprisingly, maximum levels of argCBH expression in the wild type strain were only one third of those found in an isogenic ΔargR mutant suggesting that ArgR can be an active repressor even in the absence of exogenous arginine. This may be due to the fact that, even under starvation conditions, synthesized endogenous arginine can be an effective co-repressor. Such control may be physiologically necessary as carbamoylphosphate, an arginine precursor, is also required for pyrimidine biosynthesis. Balancing these two pathways, arginine and pyrimidine biosynthesis, under nutrient-limited conditions, is likely an important physiological imperative, as complete derepression of arginine biosynthesis, by deletion of argR, causes cells to develop a partial requirement for exogenous pyrimidine (this study). The need for de novo arginine synthesis therefore appears to be balanced against other biosynthetic requirements of the cell. he multiple controls on carAB, including availability of arginine, pyrimidines as well purines  ensure that the synthesis of these macromolecule precursors is balanced in actively growing cells. Why might arginine biosynthesis be stationary phase dependent? It is well established that nutrient scavenging is an important survival mechanism in starved cultures . Arginine in particular is likely to be an important metabolite in stationary phase cultures for several reasons. As arginine represents 11 percent of the cells total nitrogen , it is potentially an important nitrogen reservoir for starving populations. Arginine is also a potential precursor for the biosynthesis of polyamines which stabilize and condense DNA during senescence  and protect it against oxidative damage [7, 8, 42]. Finally, as de novo protein synthesis in non-growing stationary phase cells is required for the expression of stationary phase adaptive proteins, this may impose a significant biosynthetic demand upon the cell both because there are many such proteins produced (see  for review) and because some of these are expressed to extraordinarily high levels. For example, Dps, a highly RpoS-dependent DNA binding protein , is almost undetectable in exponential phase, but accumulates to 200,000 molecules per cell in stationary phase (approx. 5% of total cellular protein) . Many genes are induced upon entry into stationary phase and it is likely that this creates a high demand for amino acids for de novo protein synthesis. The up-regulation of amino acid biosynthetic operons such as argCBH may provide a means to satisfy this demand in addition to nutrient scavenging mechanisms including arginine transport which is also a key factor in maintaining high arginine levels in stationary phase cultures . Biosynthetic regulons, particularly those required for amino acid biosynthesis, are often controlled by a transcriptional repressor (e.g. TrpR and ArgR). Though argCBH operon is modulated by RpoS in stationary phase cultures the dynamic range of this control was small in relation to that exerted by ArgR. Interestingly, another member of the ArgR regulon, astC, a member of the astCADBE operon, is RpoS-dependent to a similar degree . These observations, in conjunction with the results of this study, suggest that RpoS plays an important role in coordinately regulating arginine metabolism in stationary phase. Such control is likely effective because of the nature of the pathway. ArgA-mediated synthesis of N-acetylglutamate is the first committed step in the arginine biosynthetic pathway and is controlled by 1) cumulative feedback inhibition by arginine and 2) ArgR at the level of transcription . Since ArgC and ArgB catalyze early steps in this pathway and ArgH catalyzes the final biosynthetic reaction (Fig. 7), it is likely that control of these key steps by ArgR/RpoS modulates the entire arginine biosynthetic pathway. The arginine biosynthetic pathway. Note that ArgF and ArgI are ornithine transcarbamylase, while the carAB operon encodes subunits of carbamoylphosphate synthase. Adapted from EcoCyc: Encyclopedia of Escherichia coli Genes and Metabolism http://biocyc.org/ecocyc/. While our studies employed a non-pathogenic E. coli K-12 strain, the results of this study may have relevance for E. coli pathogenesis. For example, though urine is a good growth media for uropathogenic E. coli , low concentration of several key nutrients, including arginine  and iron , can be limiting. As both transport  and biosynthesis  of arginine are required for maximum growth in urine and in minimal media containing restrictive levels of arginine, control of the functions for the metabolism of this amino acid are likely critical for urovirulence. As RpoS has now been implicated in both control of biosynthesis (this study) and catabolism of arginine , it will be useful, in future studies, to establish the relative importance of these metabolic functions in pathogenesis. In summary, argCBH expression is clearly controlled by a finely balanced mechanism mediated by two signals: 1) a general nutrient stress signal mediated, in part, by RpoS and, 2) well known specific control through arginine-dependent modulation of the ArgR repressor. All strains used are E. coli K-12 derivatives. The bacterial strains, phage and plasmids used in this study are listed in Table 5. E. coli strains and bacteriophage used in this study. Template plasmid for gene disruption, cat is flanked by FRT sites. λ Red recombinase expression plasmid under control of an araC-P araB inducible promoter. All chemicals were supplied by either Sigma Chemical or Gibco BRL. Cultures were routinely grown in Luria-Bertani (LB) media and in M9 minimal media . The antibiotics used were ampicillin (100 μg ml-1), chloramphenicol (25 μg ml-1), kanamycin (50 μg ml-1), tetracycline (15 μg ml-1), and streptomycin (100 μg ml-1). All cultures were grown in triplicate from independently isolated colonies. Cell growth was monitored spectrophotometrically (Novaspec® II spectrophotometer, Pharmacia LKB Biochrom Ltd., Cambridge, England) by measuring optical density at 600 nm (OD600). Expression studies in rich media were conducted using cultures maintained in early exponential phase (OD600 of < 0.3) in antibiotic-free LB media for at least 8 generations, prior to the start of the experiment. Sub-cultures with a starting OD600 of 0.01 were grown in LB at 37°C and agitated at 200 rpm. β-galactosidase activity was assayed as previously described by Miller . ONPG was used as the substrate, and activity was expressed in Miller units . All cultures were grown in triplicate from independent colony isolates (biological replicates) and all assays were performed in duplicate. Argininosuccinate lyase (ASL) activity was determined by measuring the absorbance of fumarate hydrolyzed from argininosuccinate at OD240 nm . Cell extracts were prepared by sonication . The reaction mixtures containing 10 ug/ml protein, 1.0 mM argininosuccinate in 50 mM potassium phosphate buffer (pH7.5) were monitored photometrically at OD240 nm. One unit of ASL activity corresponds to 1 nmole L-argininosuccinate hydrolysized per min at pH 7.5 and 37°C. The one-step chromosomal gene inactivation procedure of Datsenko and Wanner  was used to generate precise ΔargR and ΔastCADBE deletion mutations. The mutation was transduced  into other strains using P1vir transduction (see Table 5). The pKD3 plasmid was used as a template to amplify the PCR fragments used for replacement of the argR and astCADBE target genes. Primers were designed such that the resulting PCR product includes the Cmr cassette from pKD3 flanked by sequences adjacent to the target reading frame in the MG1655 chromosome. The PCR primers used for argR were: forward 5'-CAATAATGTTG TATCAACCACCATATCGGGTGACTT GTGTAGGCTGAAGCTGCTTC-3' and reverse 5'-ACATTTTCCCCGCCGTCAGAAACGACGGGGCAGAGA CATATGA ATATCCTCCTTAG-3'; primers used for creating astCADBE deletion were: forward 5'-ACTTAATACCCGCAGAATGATTTCTGCGGGTAAGTA GTGTAGG CTGGAGCTGCTTC-3' and reverse 5'-CATATAAATAACGAATTATTTACTGTA GAGGTCGCT CATATGAATATCCTCCTTAG-3'. The bold text corresponds to target gene flanking sequences, and normal text represents DNA sequences of the Cmr cassette. The deletion generated the entire target coding sequence. Incorporation of the Cmr cassette into the MG1655 chromosome was confirmed by PCR using genomic DNA as a template and confirmational primers. The confirmational forward primers used were the forward primers (as described above). The reverse confirmational primer for argR was 5'-TGTCGCA GTAAAACGCACTA-3', for astCADBE was 5'-TTATACGCAAGGCGACAAGG-3'. All primers were synthesized by MOBIXLab, McMaster University (Hamilton, ON). RNA was isolated from cultures grown in LB using the hot phenol method . Primers to the argH gene (5'-CGGTTCAAACAATTCAACGA-3' and 5'-GCAGCTTTTTGCCTAACTGG-3') were used to PCR-amplify a DNA probe for hybridization studies to examine stationary phase and RpoS dependence of argH expression. RNA samples were prepared, separated by electrophoresis and hybridized as previously described . Probes were prepared and radioactively labeled by PCR as described in . Densitometric analysis of the bands was performed using a Storm® (Amersham Biosciences, Inc., Baie d'Urfe, QC) gel and blotting imaging system with ImageQuant™ v 5.2 (Amersham Biosciences, Inc.). Jeevaka P Weerasinghe, Tao Dong contributed equally to this work. This work was supported by grants from the Natural Sciences and Engineering Research Council (NSERC) of Canada to H.E. Schellhorn. We thank C.M. Patten, Y.D. Li and S. Tariq for critical review of the manuscript. We also thank E. Brown for supplying strains from the Nara collection and H. Mori and co-workers for developing these collections and making them available for general use. M.R. Schertzberg was supported by an Ontario Graduate Scholarship and M.G. Kirchhof was the recipient of an NSERC undergraduate summer scholarship. J.P.W. and T.D performed most of the experiments and, with M.R.S., wrote the first draft. M.R.S. also performed the Northern analysis. M.G.K. aided in the construction of the argR deletion strains and helped in the design of several experiments. S.Y. designed and conducted additional arginine supplementation experiments. H.E.S was the principal investigator and supervised the project.